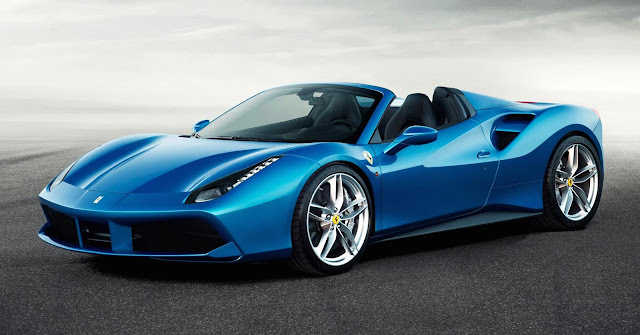 Luxury sports car brand Ferrari 488 Spider launch that claimed them as models with mid-rear V8 engine the most powerful. Ferrari 488 Spider is also equipped with a folding roof system that has been patented. Roof systems that can be folded (RHT / Retractable Hard Top) at 488 Spider reduce 25 kg weight of the car and make the cockpit more comfortable than fabric soft-top models (classic folding canvas). Only need 14 seconds of the roof is closed until folded completely. Order the chassis is made of 11 kinds of aluminum mixed with other metals such as magnesium generate robustness 23 percent better than the previous version. Ferrari 488 Spider will be officially introduced at the Frankfurt International Motor Show in September. Ferrari press release mentions, 3,902 cc engine turbo-charged V8 similar to that used on the 488 GTB, which was introduced a few months ago. Maximum power output is 670 CV with a maximum torque of 760 Nm at 3,000 rpm. Acceleration from 0 -100km / h in just three seconds, alias 100 CV is more powerful than the previous V8 engine. Turbo V8 in this model does not have a vacancy (turbo lag) as in other turbo. Added power exist at all levels round. Throttle response time was only 0.8 seconds. SSC2 (Side Slip Angle Control System) produces 12 percent faster acceleration out of corners compared to the 458 Spider.